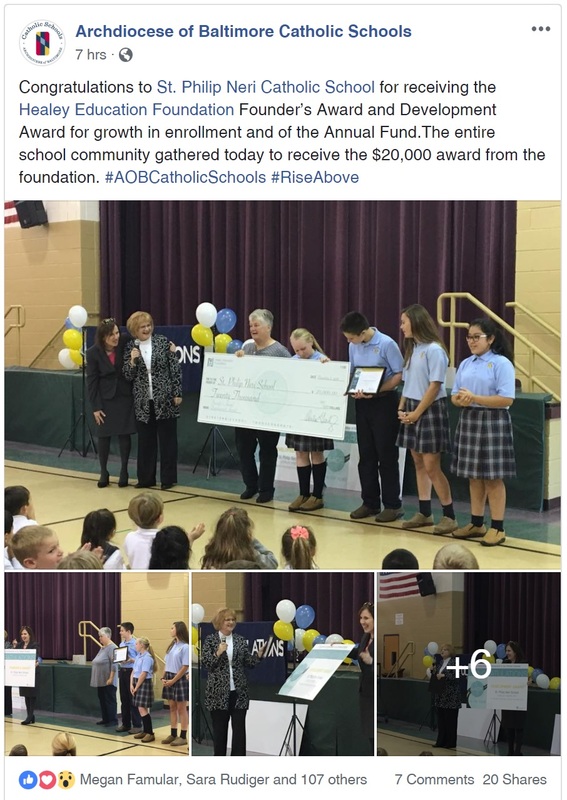 During a challenging time for Catholic schools, St. Philip Neri School (Linthicum Heights, MD) in the Archdiocese of Baltimore stands apart as an incredible success and was celebrated for its amazing transformation over the past three years. Excelling across the board, from enrollment to fundraising to governance to the overall student experience, St. Philip Neri School is poised for future success. After partnering with the Healey Education Foundation in 2015, St. Philip Neri’s enrollment has increased by 24%, and the school has seen its new Annual Fund rise to more than $75,000 in unrestricted dollars in just 3 years. For its impressive turnaround efforts, St. Philip Neri School received the $15,000 Founder’s Award for entrepreneurial spirit in action on Thursday, November 8. The school also received Healey’s highest honor in the development awards category – $5,000 for highest percentage growth (50%) in annual fund for a current partner school. 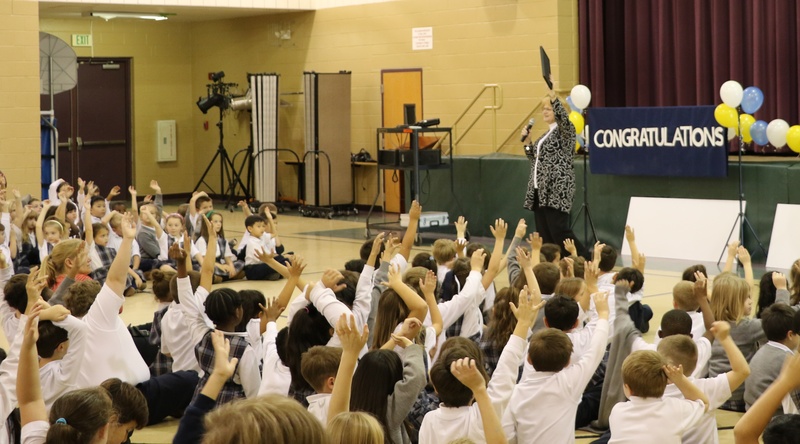 Healey Consultant Laura Lang announced St. Philip Neri School’s awards for a second time at an afternoon assembly for students. Principal Kate Daley thanked Lang for more than three years of mentoring the school through the Healey approach to Catholic school sustainability. 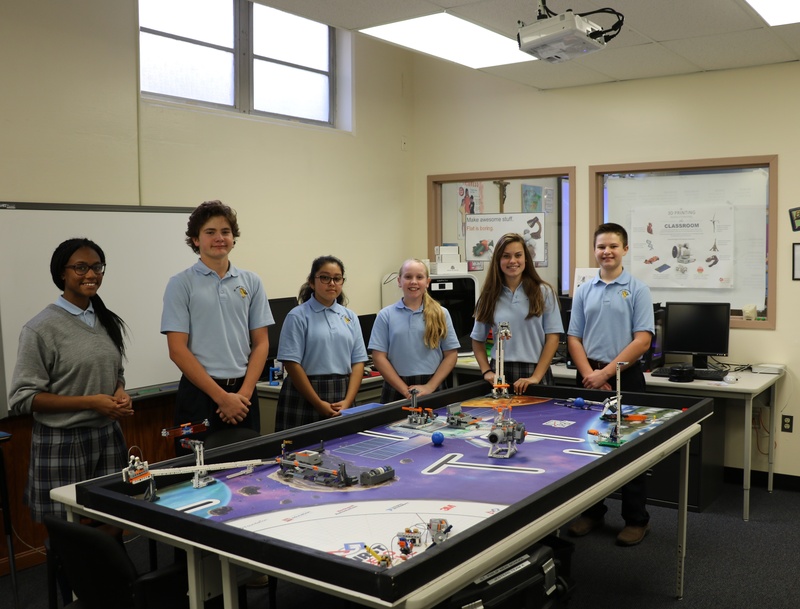 Through a partnership with Notre Dame of Maryland University, the school participated in the Academy of Catholic Educators (ACES) program to inspire and equip teachers to take full advantage of technology in the classroom and a new Maker Space lab. The school’s results included a 11% enrollment growth from 365 to 408 over the prior year and a 24% increase since its partnership with Healey began. Following the announcement of the award by video conference, the principal of St. Philip Neri, Kate Daley, held an afternoon assembly with all students to celebrate the school’s achievements. Representatives from the Archdiocese of Baltimore were also present. The growth of St. Philip Neri School can be attributed to many factors, both inside and outside the classroom. Bringing in Sue Wenzlick as an Advancement Director, the school immediately started evolving. With critical collaboration from Pastor Fr. Michael DeAscanis, the school created a new logo and tagline, proudly displaying school-wide pride, incorporating the new messaging everywhere, celebrating who they are at all times. “Nourishing the soul, mind and body,” the school works to address the whole child, including and beyond academics. On the development side, the school has moved away from more traditional candy and bake sale fundraising methods and incorporated the Healey Methodology, which has invigorated its alumni base and created sustainable fundraising for the next decade and beyond. With no annual fund prior to Healey’s involvement, the goal was to tie the dollars to visible signs of progress in the school. This has come to fruition through tuition assistance, technology, and overall building improvements to keep it modern and safe. It also provides increased professional development for teachers, keeping them on the cutting edge of new ideas, thinking and programs. As Healey staff went On the Road to deliver awards in person on November 8, schools and their diocesan colleagues posted on social media. This is the sixth annual awarding of School Advancement Grants for Excellence (SAGE) for the Healey Education Foundation. The awards recognize significant improvement in enrollment and fundraising as well as innovation by the Foundation’s partner schools. This year the Healey staff went On the Road to deliver prize money as the organization’s senior executives revealed the winners online via a Zoom video conference. Robert T. Healey Sr., Founder, and Christine L. Healey announced the recipients of $50K total in merit-based awards as partner school principals, advancement staff, board members and other hopefuls in 29 eligible schools tuned in remotely. Eight schools in five other dioceses received additional awards. Community of Saints Regional Catholic School (West St. Paul, MN) and All Saints Catholic School (Wilmington, DE) were recognized as Founder’s Award runners-up. St. Jerome Regional School (Tamaqua, PA) won for highest percentage growth in enrollment at 20%. St. Mary School (Vineland, NJ) won in the alumni schools’ development category for a 42% increase in its annual fund. See the press release featuring more details on the SAGE event, including the complete list of winners. Healey Education Foundation, a 501(c)(3) nonprofit, invests in PK-12 Catholic schools. The Foundation provides a high-impact program delivered through a coaching relationship with dioceses and schools that are ready to embrace change. Healey’s work For the Future of Catholic Schools empowers grant recipients to deliver sustainable results through effective governance, enrollment management and development. Since its establishment in 2004, the Foundation has grown to serve 79 elementary and high schools across six dioceses in Delaware, Maryland, Minnesota, New Jersey and Pennsylvania. The Foundation also co-founded and continues to support the Catholic Partnership Schools in Camden, NJ, through board participation and an annual grant. The SAGE awards ceremony and networking experience empower and strengthen the resolve of the community working to revitalize and rejuvenate pride in Catholic schools. In the six years since the premier SAGE event, the Foundation has worked with partner schools to implement enrollment strategies that have impacted 62,000 children. In that same timespan, with the Foundation’s help, partner schools have raised more than $20 million in mission-based revenue through their annual funds.